So, since I’m not doing much else with this blog thing, I’ve decided to try something new. I have no idea if it will work. I have no idea if I want it to work. But I figure, what do I have to lose by trying, right? ;P So, welcome to the first edition of Wrappin’ Up The Month with Fog! In these posts, I will attempt to recap what I’ve been doing for the past month and what I would like to do in the month(s) to come. Be warned, this post is long so let’s get to it, we don’t have a lot of time here. So, the writing thing. Let’s start with fanfiction. I’ve been working diligently on Changing History rewrites, but not much else. I’ve also been trying to prepare for Camp NaNoWriMo July, but that hasn’t gone nearly as well as I’d hoped. I’ve been pretty distracted by rewrites and other not-so-important things. But yeah, I’ve made it most of the way through the rewrites now, and I’ve decided that once I’ve finished rewriting Second Chances, I’m just going to jump right into posting Part Four, Search For The Entwives, even though the first draft isn’t finished (which is irking me, by the way). As far as original work goes, I have started formulating a plan for one of my stories, an Alice in Wonderland reimagining that I started as a NaNoWriMo project a few years back. I think this story is going to be my NaNo2015 project. I don’t want to get into too much detail, as it’s all pretty hazy at this point, but I’ve been thinking a lot about it, how I want to present it and market it, which is more progress than I’ve made in a very long time. I will keep everyone updated as this seed of a plan develops. Harry Potter and the Prisoner of Azkaban– I’ve been rereading the Harry Potter books on audio for the past couple months and I finally got to my favorite of the entire series. Book Three was my favorite book the first time through, and I am happy to report that it has held up to the high standards I had set for it. I’d also like to say that, even though I know all the major plot twists, it has been so much fun to reread the books again with a new perspective. I’m also watching the movies as I re-read the books and I’m enjoying comparing them to each other. I haven’t watched PoA yet, but I’m looking forward to it. This re-read has also inspired thoughts of a new fanfiction (big surprise, I know ;P) and I’m having fun imagining my new character in each of the books. Nation by Terry Pratchett– I started this book as a book club read in April. I managed to get about halfway through, but April was a pretty busy month for me, so I didn’t manage to finish it before the library required it back. I finally got it back from the library early this month… and finished it in one night. I couldn’t put it down. It was just so beautifully written. It’s hard to describe really. And the end took my breath away. It was really, really good and I highly recommend it, especially if you’ve never read Pratchett before, and are intimidated by all of the Discworld books. This is a separate book all on its own, so you can get a feel for how he writes, without committing to a whole series. Basically, it’s wonderful. The Color of Magic by Terry Pratchett– I started this back in April, but as I said before, April was a busy month for me. 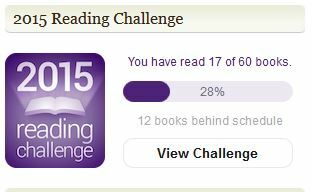 I’m planning to start it back up in July, if I can get a few of my book club reads out of the way first. What I read was good though, I’m excited to really dig into the Discworld books from the beginning! Inuyasha #2: Family Matters– I received a stack of these mangas as the result of a book swap on Ravelry. Inuyasha is a guilty pleasure from my failed community college days, when I would stay up until all hours of the night to watch repeats of the anime on Cartoon Network. I recently discovered that the entire series is on Hulu, which has renewed my love of the series. As I usually do with this kind of thing, I’m enjoying comparing the manga to the anime. So far, it is very similar, but there are some things in the translations that are much funnier in the book. It’s been very entertaining so far, and I’m looking forward to the rest of it. The Wonderful Wizard of Oz by L. Frank Baum– This is my “running” book. I have it on audio from Librivox on the Nook Audiobook app (free audiobooks, hurray!) and I’ve been listening to it as I try to run my Couch to 5k program. It’s just as lovely and magical as I always imagined it would be. I have laughed so much at the different characters and I’m enjoying watching the Scarecrow, the Tinman and the Lion work through all these obstacles with traits that they all claim not to have. I think there might even be a message about self-confidence in there somewhere, but I’ll save that for a book review. The Help by Kathryn Stockett– This is an audiobook I got used for six dollars. And it is possibly the best six dollars I have ever spent. I’ve heard so much about this book, but somehow no one ever told me it’s a book about writing a book! How is it that no one ever told me this??? And I love the characters so much, every single one of them (okay, maybe not Hilly so much, but everyone else has at least a few redeeming qualities ;P). It’s written in different points of view, Abilene, Minnie, and Skeeter, and the actresses who read the different parts are perfect. I have laughed, I have cried, and I haven’t even finished the book yet! I can’t wait to watch the movie and compare! The Strange Case of Dr. Jekyll and Mr. Hyde by Robert Louis Stevenson– This is a book I recently started on impulse while I was knitting. I wanted something to do that wasn’t watching television. I’m not terribly far into it, but I am intrigued by the differences I can already see between the original material and the interpretations that I’m familiar with. It’s definitely creepy and I can’t wait to find out more. Alright, as I mentioned briefly in the reading section (under The Wizard of Oz) I am trying out one of those Couch to 5k apps. The app I’m using is C25K Free for Android, just in case anyone is interested. It’s a pretty cool app, it runs simultaneously with my Nook Audiobook app, so I can listen to my book and the C25K app pauses my book to tell me when to run and when to walk, so I don’t miss anything. I have managed to work my way up to Week One this month, which is an accomplishment for me. I found a little park not far from where I live that has a sidewalk for running/walking. It’s pretty and I get to spend about an hour listening to an audiobook and trying not to feel self-conscious. I keep telling myself that it’s good for me, not just my body but my mental state as well, but I’m not seeing any results yet. Basically all I’ve accomplished is discovering that my ankles hurt all the time and spending a ton of money trying to find ankle supports I can wear with my shoes. But I’m gonna try to stick with it, despite my tough schedule and the intense heat down here in Texas. It hasn’t been too bad where I live yet and I make sure to go just as the sun is setting so it’s cooler, but man, it is something else. I’ll try to remember to post my updates on my Twitter (and consequently Facebook) so you guys can keep up with this insanity. I have no idea what I’m doing. Writing: July is Camp NaNoWriMo! I plan to write the first draft of a brand new fanfiction, a Loki/OC set during the year of his imprisonment in Asgard (Thor: The Dark World). In the event that the first draft does not make 50k words (which, if I’m being honest, is pretty likely), I’m going to write up the first draft of a short continuation of my Bruce Banner/OC, Worth Living For. Basically, this is the month of Avengers writing! I am going to attempt to continue to post at least one rewritten chapter for Changing History, but that is not my priority this month. Social Media: I am going to try to post more frequently. No really, I solemnly swear! Even just scrolling through Tumblr and reblogging things, or posting to Instagram with what I’m knitting and/or crocheting. I’m also going to try to add more of those posts to my Facebook and Twitter. Since I’m working on something new for Camp, keep an eye on the Twitter feed, I’ll probably be doing some word sprints with the NaNoWriMo Word Sprint peeps! My personal life: Honestly, I just want to get through Week Four of my Couch to 5k. If I do that, I will feel like I’ve accomplished something. And I have Tour de Fleece coming up in July as well, which is a challenge to spin yarn while the champion bike racers spin the Tour de France. I’m looking forward to it, especially in light of the weird amount of attention this post got on my tumblr a few months ago 😛 Keep an eye on my Instagram and Tumblr for updates!